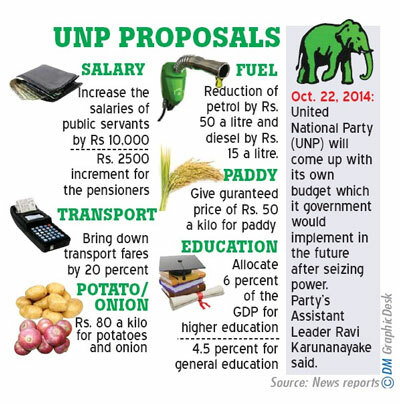 The United National Party (UNP) will prepare and present its own budget to be implemented by a future UNP Government, Assistant Leader Ravi Karunanayake said yesterday. He told a media briefing that the UNP would present its proposals after President Mahinda Rajapaksa presents his Budget on Friday. Mr. Karunanayake said a future UNP Government would increase the salaries of public servants by Rs.10,000 in contrast to the salary increment of Rs.5000 which the United People’s Freedom Alliance (UPFA) Government is expected to offer in the October 24 Budget; a Rs.2,500 increment for pensioners, reduction on the price of petrol by Rs.50 a litre and diesel by Rs.15 a litre so as to bring down transport fares by 20 per cent. “The UNP will give farmers a guaranteed price of Rs.50 a kilo for paddy, Rs.80 a kilo for potatoes and onions and allocate six per cent of the GDP for higher education and 4.5 per cent for general education,” he said. Mr. Karunanayake said all these concessions would be given by reducing unwanted expenses spent on Mihin Lanka, SriLankan airlines. 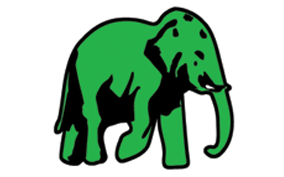 Also Mr. Karunanayake said a future UNP government would bring down interest rates by 2 per cent. “Our policy is to come up with realistic concessions unlike this government which puts Rs.100 into one pocket and takes away Rs.1,000 from the other,” he said adding that Friday’s Budget would be election oriented with a host of unrealistic concessions.